Disengaged employees undermine your company’s morale, erode the bottom line, and endanger the long-term success of your business. If that isn't bad enough—according to the US Department of Labor, 64 percent of working Americans leave their jobs because they do not feel appreciated. 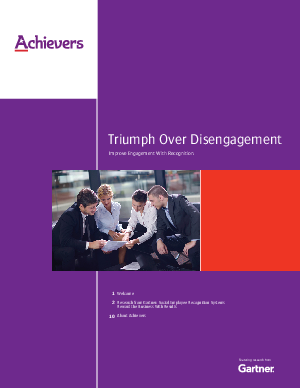 Your company can triumph over disengagement. Download the latest study from Gartner to learn the benefits of a new generation of social-enabled technologies designed to improve employee engagement, alignment, and recognition.